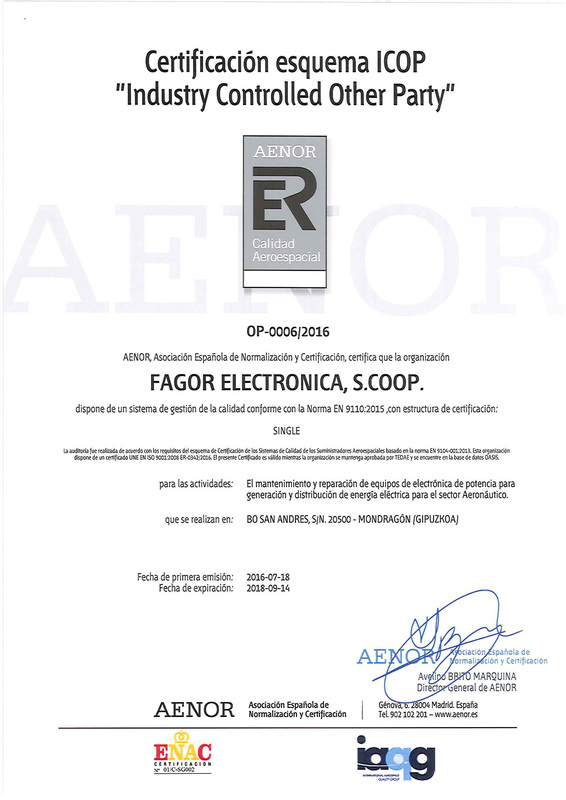 Fagor Electronics obtains the EN 9100 and EN 9110 certificates for the aeronautical sector. Both certificates are required to become a reference provider in the electronic aeronautical sector. Since last January, Fagor Electronics is supplying the firsts units of inverters to one of the major aeronautics consortia in the world. Both certificates include requirements, mainly in the field of quality, safety and technology in all stages of the supply chain. They have became the main requirements for aircraft manufacturers to their suppliers. The implementation of EN 9100 is not considered an option, but a necessity if the organization wants to remain competitive. The legislation affects performance improvement, risk reduction, reducing the amount of waste and implementation of continuous improvement. Being accredited by the EN 9100 standard is a differentiating factor. If you have any question, doubt, suggestion or any queries, contact Fagor Electronica through this form or by any of the usual means. We will be happy to assist and help. Thank you!